How many of the greatest ski resorts have you been to on our list? 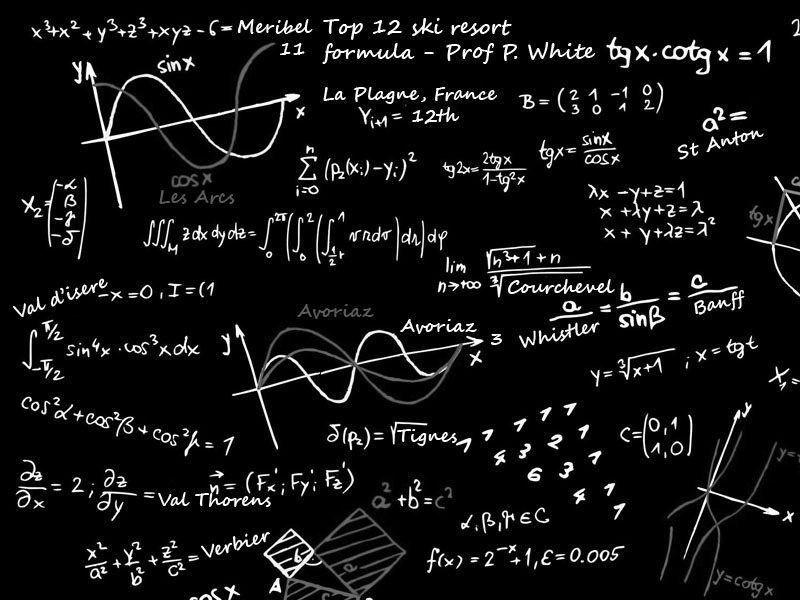 From analysing our Google Analytics data from the 2017/18 season, we’ve come up with the greatest list of ski resorts from the most-visited pages on our blog and website. We combined the data and in reverse order created the 12 greatest ski resorts, chosen by you, our lovely customers. We have kept the information in bite-size chunks and removed the clutter so you can find a resort that suits your need. Belle Plagne (2,050m) – a completely ski-in/ski-out purpose built resort with a vast array of self-catered accommodation. There is a good mix of quality and there are also some lively bars and restaurants (although nothing too crazy). Plagne Centre (1,970m) – this is slap bang in the middle of La Plagne and this is where the majority of the bars and restaurants are. There aren’t too many accommodation options, but it is easily accessible by bus from most parts of town. Plagne Soleil/Villages (2,050m) – This resort gets a lot of sun and is especially great in Spring. There are a good amount of shops & restaurants but no vast choice compared to Plagne Centre, however, there is regular access to Plagne Centre by bus. 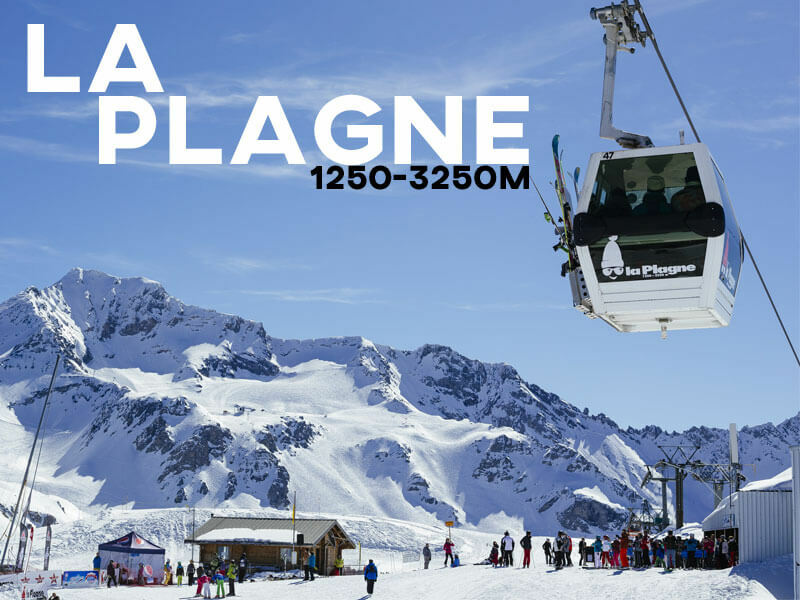 Aime La Plagne (2,000m) – located just above Plagne Centre and very similar to Plagne Soleil as a resort. La Plagne is an intermediate's paradise with a huge number of blue (52%) and red (26%) runs and gentle tree-lined pistes to cruise down. The local ski area is on a gentle plateau made up of wide, undemanding slopes way above the tree line. Beginner tip: There is at least one free ski lift in each of the villages in La Plagne for beginners to find their ski-feet before purchasing a lift pass and using the main ski lifts. Experts needn't be disappointed as there are some steeper slopes as well as extensive off-piste. Highest Ski Area - 3,250 metres (10,660 ft)! Green - Belle Plagne Area- The best access the plethora of easy blues to learn on and build your confidence up. Blue - Mira- Offers a surprisingly bracing drop from La Grande Rochette, great for all the family. Red - Combe - You will find the long plunges delightful and quiet to ski in the morning. Don't leave it too late in the day. Black - Morbleu - Advanced skiers only who want a leg burner and a challenge on their carving technique. Those looking for apres should head to Plagne Centre. 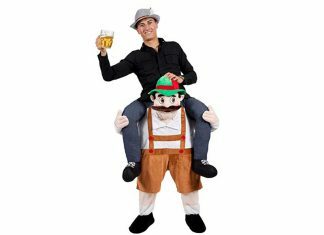 Whilst not as lively as the likes of Val d'Isere or other party resorts, there is plenty to keep the casual apres-skier entertained. Scottys is a particular highlight and there is usually a DJ at La Bergerie on the mountain which turns into an apres-ski hotspot. If you are looking for a place to stay in La Plagne, we have a range of accommodation to suit your needs. Stay in one of many Hotels in La Plagne that have been handpicked offering up a full hotel experience with a touch of class. Alternatively, we offer a range of Self Catered Apartments in La Plagne which provide quick or convenient places to stay and provides a vastly improved apartment experience than ever before. Looking for more accommodation in La Plagne? Click here and see what we have waiting for you for this season, but be quick! Whether you are looking for ski-in/ski-out access and family-friendly ski schools, supplied like nowhere else in Les Arcs 1950, or a more traditional village like Peisey-Vallandry, there really is something for everyone! 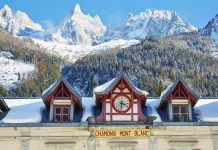 You can expect beautiful views of Mont Blanc, glacier snowsure slopes, varied skiing with lots of long descents and plenty of tree runs, plenty of challenging steep pistes for those more advanced skiers, an enormous amount of off-piste and an awesome snowboard and ski terrain park. Les Arcs 1600- The cheapest resort in Les Arcs which is connected to Bourg St Maurice and the Eurostar by a high-speed funicular. It is very affordable and quieter compared to the other resorts, perfect for families. 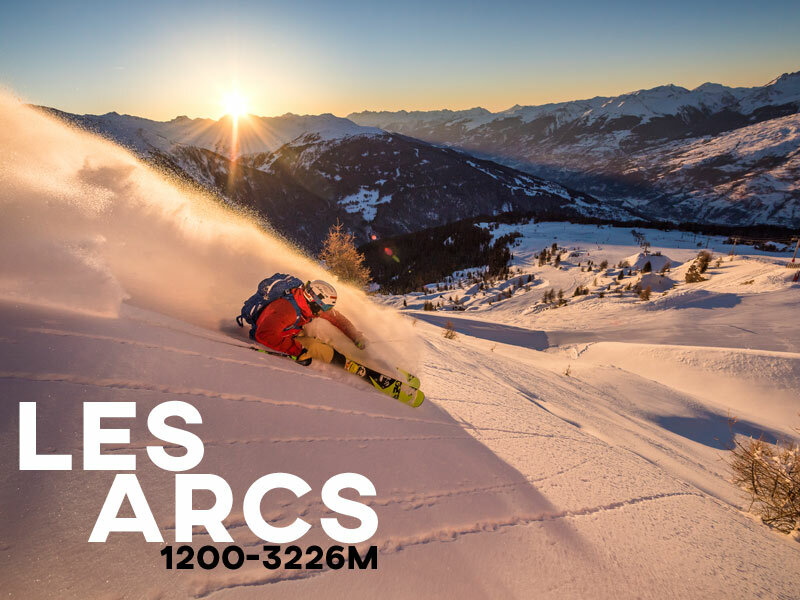 Les Arcs 1800 – Party time! This is the liveliest of all resorts in Les Arcs. This is where the University trips go and there is great apres to be explored. Most accommodation is ski-in/ski-out and there is a range of very affordable (Belmont) to very high end (Hotel Aiguille Grive). Les Arcs 1950 – This is arguably the best purpose-built resort going with fantastic facilities for all abilities and every apartment is ski-in/ski-out! Les Arcs 2000 – It’s a purpose-built resort at very high altitude with fantastic ski access! Whilst not the prettiest, it is extremely functional. Les Arcs is one of the world’s biggest ski areas with plenty of pistes opening up one of the world’s biggest lift-served verticals at more than 2000m and using high-speed lifts systems. Beginners will benefit from the long, smooth pistes down to the villages of Arc 1600 and Arc 1800, whereas the more thrill-seeking skier will revel in the bowls and inclines on the Aiguille Rouge. The high-altitude skiing on the Glacier du Varet as well as a multitude of tree-lined runs further down the mountain provide a huge range of terrain to ski on for all abilities. Here are our favourite ski runs in Les Arcs: Renard– wide and sweeping, great for beginners. Les Arcs marks it easiest runs as blue so don’t be put off. Vallee de L’Arc – runs from the top of the brand new Pre-St-Esprit lift all the way to the bottom and takes you past Les Arcs 2000 and 1950. At the bottom, there is a traditional chalet restaurant and the heated seats on the Pre-St-Esprit are a real treat! Arandelieres – This run takes you from the Aiguille Rouge at 3226m and joins other runs to take you all the way to the bottom of the resort. A real leg burner with stunning views. Aiguille Rouge – 7km non of nonstop enjoyment into Villaroger. When the Aiguille Rouge lift is open this will be packed and mogul heavy. Advanced skiers will want to tick this off their to-do list. Les Arcs 1800 is the best place for apres ski, which offers a great range of wild clubs, apres bars and quieter bars for those who want to relax with a quiet drink. Looking for more accommodation in Les Arcs? Click here and see what we have waiting for you for this season, but be quick! Banff is a fantastic resort that is only 2 hours away from Calgary International airport. With the Ski Big 3 ski pass, you can ski Mount Norquay, Sunshine Village and Lake Louise and easily accessed by a free ski bus, which gives you access to incredible backcountry skiing. There are barely any queues and the friendly lift attendants are always on hand to help. 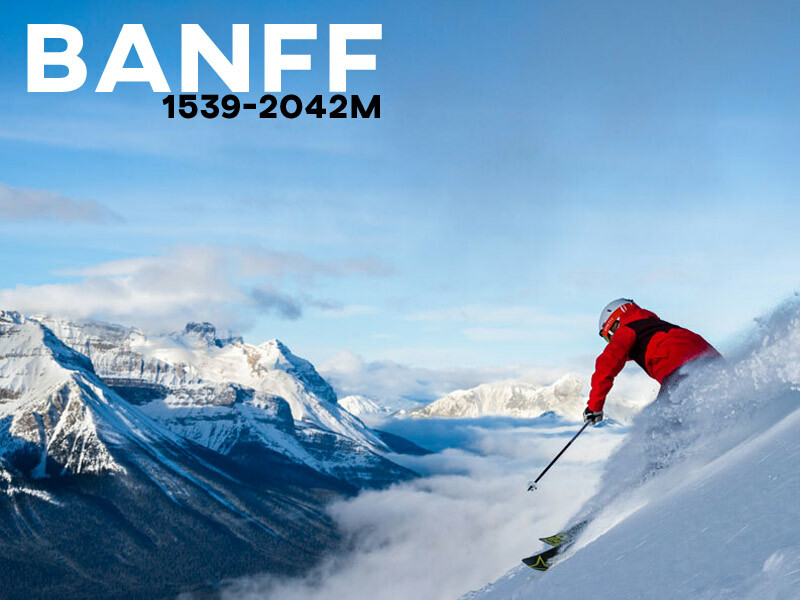 This is one of the reasons why everyone sees Banff as one of the greatest ski resorts in the world. It has an attractive main street full of bars, restaurant, shops and was once a spa town, due to its natural hot springs (a visit to these is included in the lift pass). Lake Louise– this is the best area for beginners with plenty of flat greens to practice on. Sunshine Village – 55% of intermediate terrain and haven for powder bowls. This was our favourite area on the Ski Big ski pass. Mt Norquay, Red 19– Steep drops but then goes nicely into blue 19 which give you a long and wide skiing experience. Sunshine Village – This is the powder hounds playground but only go with avalanche equipment and an experienced guide. Banff town is a lively resort with many bars, restaurants and clubs. It’s not like the apres ski scene in most of The Alps (spraying champagne and dancing on tables), but rather more a sociable option to grab an apres ski snack and a few drinks at the ski area base stations at Lake Louise or Sunshine before catching the shuttle bus back to your accommodation. Ice skating on Lake Louise, horse-drawn sleigh rides, ice magic Festival, hike In Johnston Canyon to name a few. Looking for more accommodation in Banff? Click here and see what we have waiting for you for this season, but be quick! 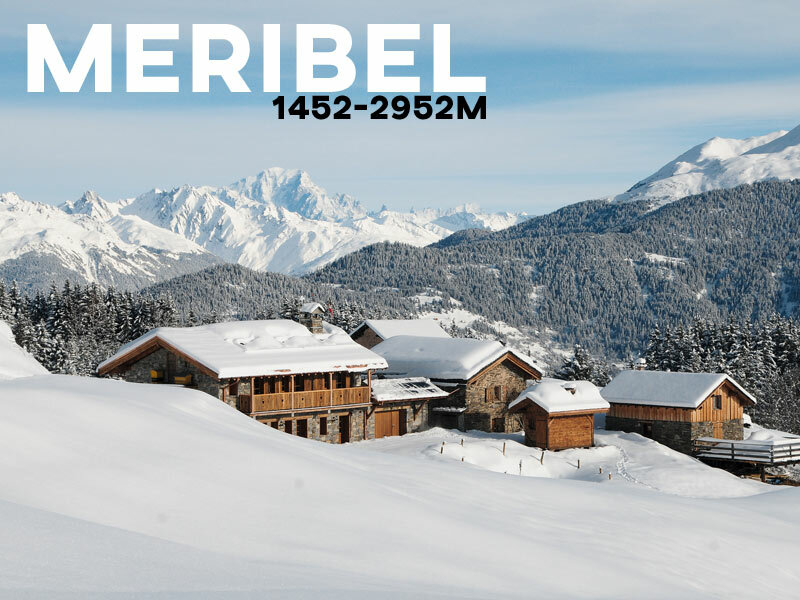 Meribel’s position in the heart of the world-famous Three Valley ski area gives access to 600km of pistes and unlimited off-piste skiing making this ski resort popular with all types of Winter Sport enthusiasts. A lack of snow is rarely a problem in Méribel, with their snowmaking machines increasingly used and new ones being built. Some of the runs tend to get slushy because of the afternoon sunshine later in the season, but you have Val Thorens just next door to supply the high altitude skiing. Blanchot– Easy and wide, great for beginners to warm up on and build your confidence. Lapin – This is a personal favourite with fun tree runs and is ideal if the light is flat; good tip! Combe Vallon- This is an epic long run that starts at the highest point in Meribel. Combre – Difficult and sometimes scary start but with fantastic views for advanced skiers. Meribel apres ski offers a varied and lively nightlife with loud pubs and popular nightclubs open until the early hours. Après Ski in Meribel is centred around the British run bars with live music being the key feature making it a popular holiday destination. 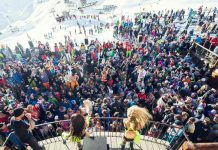 If you are staying in Meribel, be sure to make the most of the entertainment on offer and see our brief rundown of the best apres ski on offer in Meribel here. Looking for more accommodation in Meribel? Click here and see what we have waiting for you for this season, but be quick! 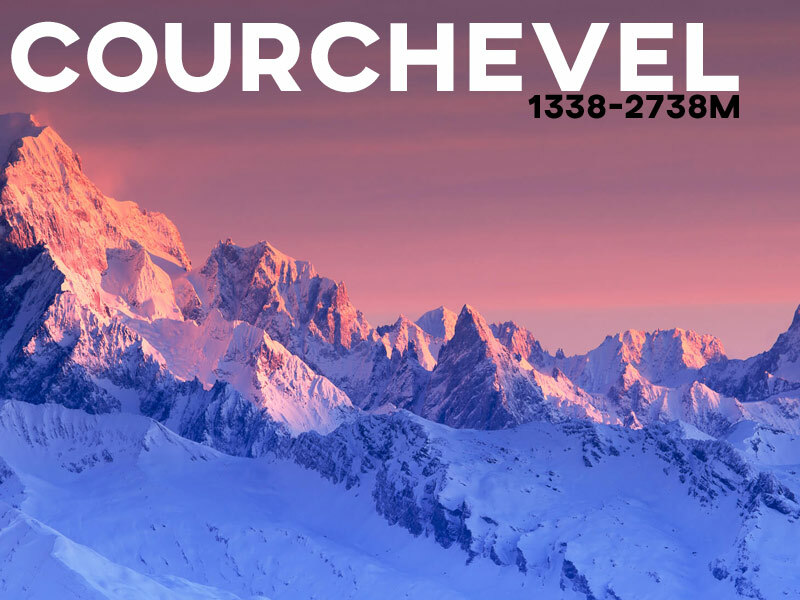 Courchevel Ski Resort is split over 4 levels ranging from 1300 to 1850 guaranteed snow throughout the season. The resort’s north-facing slopes mean the snow conditions are some of the best in the Three Valleys' entire 600km. The perfectly-groomed pistes that glide into the Courchevel resort are ideal for beginners, who may find that a local lift pass will be enough. Intermediates and advanced skiers are also spoilt for choice with over 600km of immaculate pistes to explore in the wider Three Valleys ski area. This is a fantastic resort for beginners and intermediates, which is why it's perfect for families to enjoy a holiday in. For those who need more of a challenge, you have the WHOLE of the 3 valleys to explore, we would recommend heading to the mogul fields on Meribel ... Enjoy! 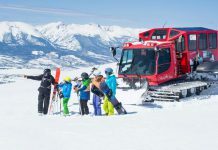 Jardi Alpin Lift- Beginners are best starting at the ski area sandwiched between the Biollay and Jardin Alpin ski lifts or head to 1650 where there is a good network of green slopes. Creux- At the top of The Saulire and Marmottes lifts, it's a great one to warm up on in the morning. Also, there are great blue runs above Courchevel-Moriond 1650, perfect for intermediates or when you just want some easy skiing in a beautiful scenery. Bouc Blanc- This run goes down to La Tania, it starts high up, it is a nice open run that is lined with trees and tends to stay in good condition through the day. Jean Blanc - The best black runs are towards Le Praz, including Jean Blanc and Jockeys are great for a leg burner. Ski over to the Meribel/Courchevel Follie Douce for some wild table dancing or The Schuss Bar in 1650 offers a lunch menu with delicious burgers and charcuterie, or in the evening, book yourself in for a cheese fondue. Ice skating in the forum, Aquamotion (spa pool, activities, activities centre), horse carriage rides, tobogganing to name a few. Looking for more Courchevel non-ski activities? In Courchevel, there is a great range of catered chalets, apartments and hotels to meet all budgets. Looking for more accommodation in Courchevel? Click here and see what we have waiting for you for this season, but be quick! As far as skiing goes and despite general belief, beginners are really well catered for due to a large beginner area and plans to link this in the Savoleyres bubble next year will only make this better. With a ski area as huge as Verbier and the 4 Valleys, the region offers a wide variety of slopes for absolutely everyone from gentle cruising blues and fast fun blacks to famous mogul fields such as Tortin. Here are our favourite ski runs in Verbier: Le Rouge– Safely set your sights on a more incline run. La Chaux 2– Mellow decent; perfect for learning on or warming up those legs for a big week ahead of skiing. Le Nord– Short, sweet, moderately steep and speckled with trees. Mont Fort -Steep and will challenge any advanced skier or boarder. We would advise going early morning when the slope is in its best condition. 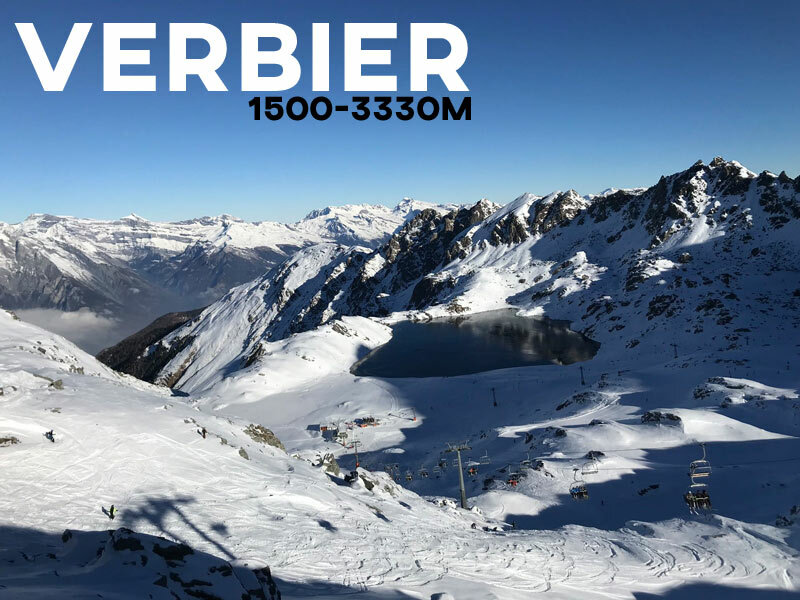 Verbier is one of the world’s cult resorts, whether you are a powder seeker or a non-skier Verbier has something to offer everyone. There is a great selection of shops and boutiques, and also a range of non-skiing activities which also include an excellent sports centre, hiking trails, ice rink, husky sledging, paragliding and not forgetting the many bars and restaurants that Verbier has to offer. Looking for more Verbier non-ski activities? If you are looking for a place to stay in Verbier, we have a range of accommodation to suit your needs. Stay in one of many Hotels in Verbier that have been handpicked offering up a full hotel experience with a touch of class. Here are our favourite 3 hotels in Verbier. Looking for more accommodation in Verbier? Click here and see what we have waiting for you for this season, but be quick! At Tignes, you can ski before and after everyone else. That’s the motto of this large resort, which offers summer glacier skiing and a winter season stretching from September to May. The high altitude means its snow is almost always in good condition too: especially up on the Grande Motte glacier. Tignes caters for all needs and budgets. 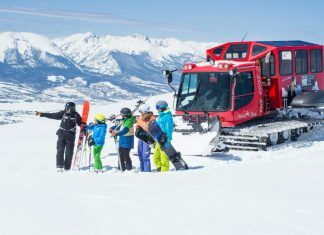 From family-friendly activities to adrenalin junky and wild apres ski parties, it really is a resort for anyone and everyone. The ski area includes 300 Kilometres of ski runs located at altitudes ranging between 1,550 metres and 3,450 metres, at varying levels of difficulty. The ski resort is split into four areas: La Grande Motte, Palet – l’Aiguille Percée, Tovière, and Les Brevières. Tignes is an unbeatable choice for convenience when learning to ski, which is why it’s perfect families and large group with mixed abilities. For advanced skiers we recommend heading to the glacier which can be easily reached by the Perce-Neige funicular in just 7 minutes, followed by a cable car. Here are our favourite ski runs in Tignes: Lavachet– Right in the town so perfect for beginners. Corniches– La Aiguille Percee- This area has lots of rolling blue runs and great fun for all abilities. Cirse– Super-smooth carving terrain will warm you up for the day. Campanules or Epaule De Charvet – There are the toughest runs you will find in Tignes, they were used for Olympic downhill runs. You were warned. Tignes apres ski bars is some of the best in the Alps! Tignes has a varied and lively nightlife with loud pubs and popular nightclubs open until the early hours. Click here to see more of the best Tignes apres ski bars. Tignes, like all other ski resorts, is mainly about skiing, but it does have plenty of alternatives for those non-skiers or those looking for something extra. You can go ice diving, ice driving, ice climbing or leave the ice and relax in the spa facilities. 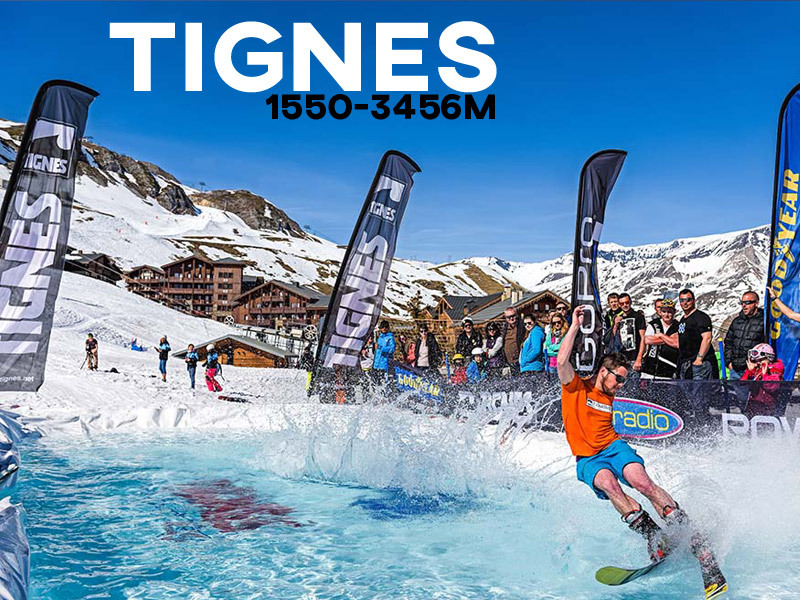 Looking for more Tignes non-ski activities? If you are looking for a place to stay in Tignes, we have a range of accommodation to suit your needs. Choose from one of many Hotels in Tignes that have been handpicked offering up a full hotel experience with a touch of class. Alternatively, we offer a range of Self Catered Apartments in Tignes which provide quick or convenient places to stay and provides a vastly improved apartment experience than ever before. Here are our favourite 3 places to stay in Tignes. Welcome to North America’s largest ski resort! Whistle Blackcomb offers more than 200 marked trails that include in-bounds backcountry, wide-open glaciers, powder-filled bowls, secluded glades and perfectly groomed trails. There are 3 main areas to ski, Whistler village (main village), Blackcomb (smaller village, 10 min walk) and Creekside (10 min drive) with a free shuttle bus to get your around. 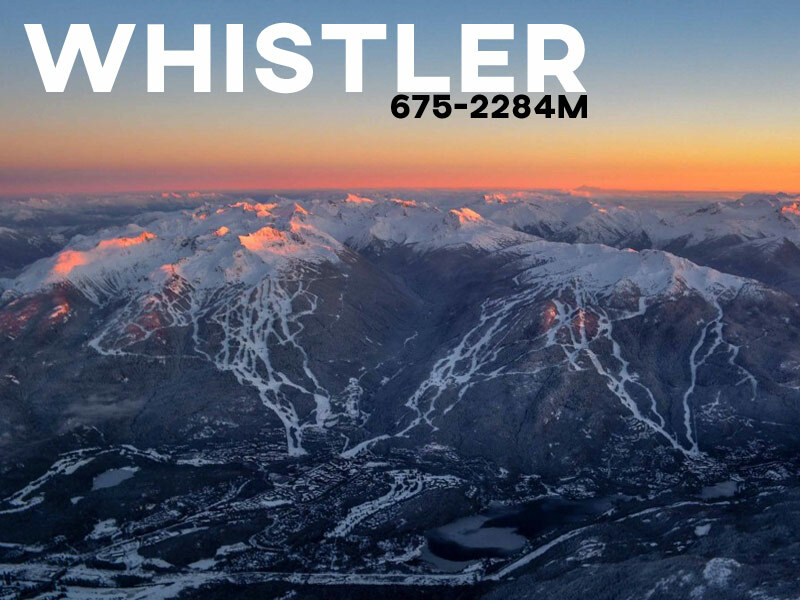 Whistler is very popular with families and intermediate skiers due to the vast ski area and incredible snow. With an incredibly reliable average snowfall of 12m, Whistler is a snow sure resort, for sure! The ski area is one of the largest in the world, with some 8,000 acres of pistes and 1,610m of vertical, open from Mid-November until May. The skiing and snowboarding is world class, and will suit all needs- both off-piste and on- carefully groomed nursery slopes with ski schools, plenty to easy blue and green slopes for those finding their feet in the snow, and even of more options for those at a more intermediate level including the bowls and the Extremely Canadian off-piste tours for those who fancy something a little more daring. Here are our favourite ski runs in Whistler: Ego bowl (Whistler side) – Very wide run, ideal for progressing beginners who have mastered turns. Joins onto a gentler green, Upper Olympic, to join back to the beginner’s area. Upper Cloud Nine in Blackcomb -one of our favourites due to beautiful views and the option to enjoy popping in and out of the tree. Upper Dave Murry in Whistler – a real endurance test and steep in at the start. Don’t be tempted to head in the trees for an easy ride down, get the full experience. Monday’s in Whistler -This short, wide but fast run will test your endurance ability. Enjoy! In Whistler, there is a huge range of hotels available for all budgets and group sizes. Looking for more accommodation in Whistler? Click here and see what we have waiting for you for this season, but be quick! Val Thorens is the highest ski resort in Europe and always offers great snow conditions. It is situated at the head of the 3 Valleys, and all accommodation is ski-in-ski-out! What more could you ask for? The village is very popular with university group (in January) and families (all year round). 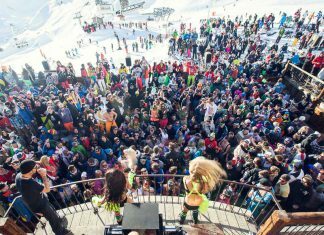 The apres ski scene is one of the biggest in Europe, so expect lots of epic parties! Val Thorens’ atmosphere is informal and friendly to a wide variety of restaurants, clubs and a stack of other activities and it is car-free. Skiing in Val Thorens is suitable for all levels, with some fantastic beginner slopes all the way through to some of the more challenging off-piste itineraries in the Three Valleys for advanced skiers. Ski holidays in Val Thorens are a sure way to get the most out of the snow from December to April. Here are our favourite ski runs in Val Thorens: Rond Point des Pistes – Welcome to the beginner playground of green runs. You will find this is where all the ski school come to teach. Blanchot & Tetras -Long and enormous run thanks to the combination of the two runs. This is great for all abilities to enjoy. Christine – Long, wide run over rolling terrain. You can spend hours here and have endless fun. Best to come in the morning. Combe de Caron -Steep first section, requiring endurance. Also best to come early morning as it will get very cut up after 12:00. Val Thorens, like all other ski resorts, it is mainly about skiing, but the Val Thorens non-ski activities scene it huge! If you fancy a day off the slopes, here is a great selection of activities for you, ice driving was our favourite experience! In Val Thorens, there is a huge range of apartments and hotels available for all budgets and group sizes. 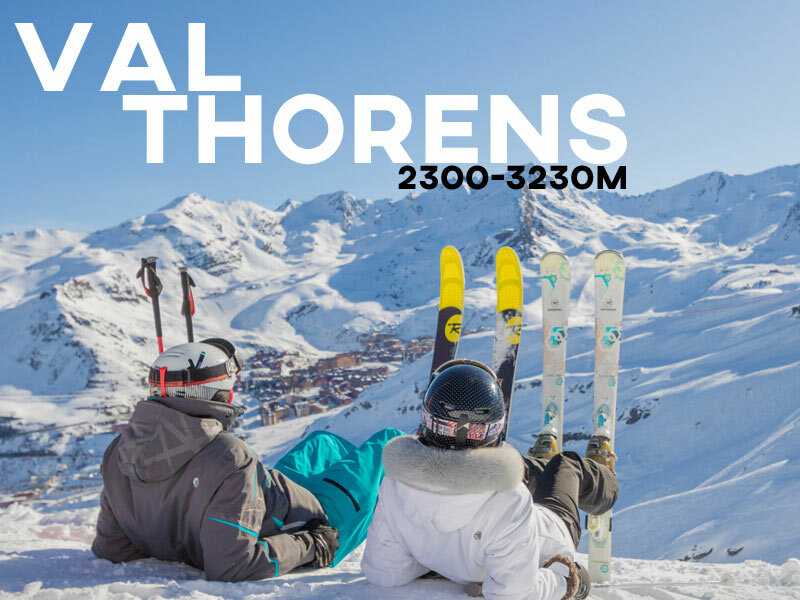 Looking for more accommodation in Val Thorens? Click here and see what we have waiting for you for this season, but be quick! We were surprised to see Avoriaz reach third place, but then remembered what this incredible resort has to offer all abilities, groups and tastes. Avoriaz’s unique hilltop resort is one for the bucket list. 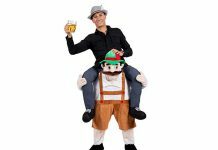 Every accommodation is ski-in/ski-out and as it is a car-free resort the only way to get around other than by foot is horse and cart or a piste basher taxi. Kids will love the horses wandering around the resort. There are great on and off-piste options to be found for the adventurous and beginners. A great all-round ski resort. Every March the hold the notoriously fun music festival Snowboxx, very popular with students. The Portes du Soleil ski area stretches over 650km of piste across France and Switzerland and remains a strong contender in the battle to become the biggest linked ski area in the world. Avoriaz has perfect nursery slopes next to the resort which, while small compared to the size of the resort, are sunny, good for snow, and link well to longer gentle runs. For intermediate and advanced skiers, there are 240km of blue and red trails in Avoriaz and Morzine alone. If that’s not challenging enough, Avoriaz offers some of the biggest moguls in the world on The Wall. Here are our favourite ski runs in Avoriaz: Ecoles– It has two slow drag tows, perfect for beginners to learn on. Prolays-Enjoy a wide piste, finishing in Lindaret bowl. It’s a personal favourite. Arare Sectors – Longest runs in the Portes du Soleil & steepest in Avoriaz Swiss Wall -One of the hardest black runs in Europe! Do you fancy the challenge? Here are our guest’s favourite non-ski activities. Night sledging, Aquariaz swimming pool, snow bikes and one even went skydiving! 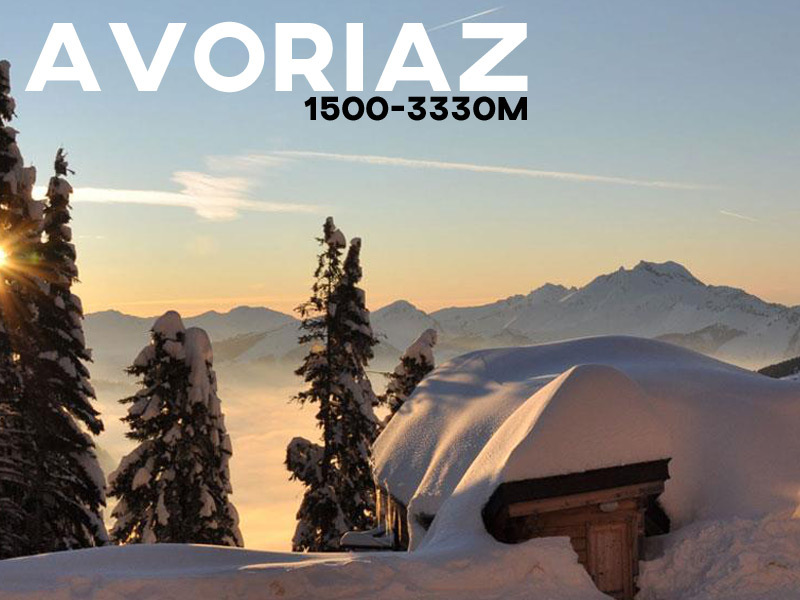 Looking for more accommodation in Avoriaz? Click here and see what we have waiting for you for this season, but be quick! 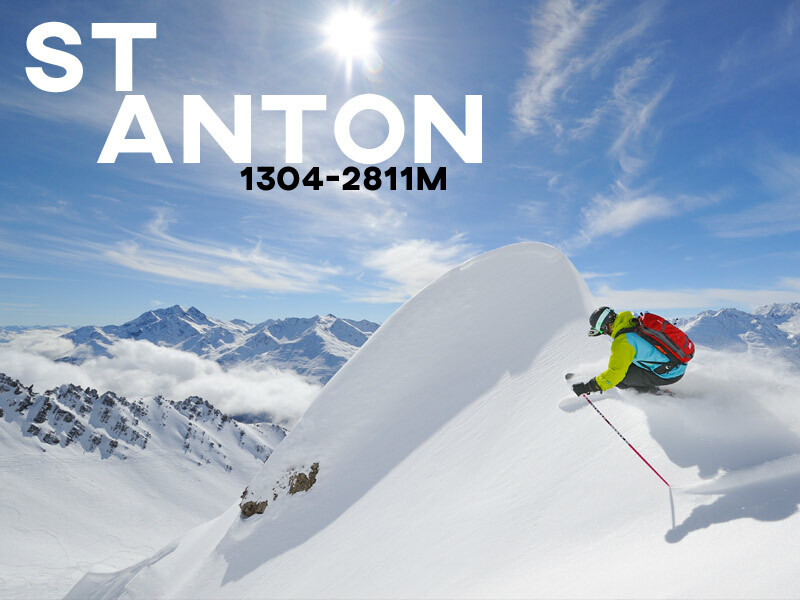 St Anton is often a firm favourite with anyone who loves to ski hard and apres ski even harder! The large Arlberg ski area plays host to over 98 lifts, allowing you for skiing from St Anton all the way to Warth without getting a bus. The Flexenbahn Cableway has made the Arlberg skiing area the largest contiguous skiing area in Austria. Snow conditions are generally reliable in St Anton with an average of 7m of snow each season but it also gets 60 sunshine days during the ski season. Head to ‘the beach’ on the Rendl side for maximum sun exposure! The resort is legendary for its incredible off-piste conditions and abundance of powder. The large Arlberg ski area plays host to over 97 lifts, allowing you for skiing not only in St Anton & Lech but to also Zurs, Stuben, St Christoph, Zug and Warth, meaning you’re not going to be short of places to explore on a week’s holiday. 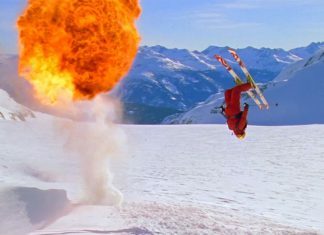 St. Anton is renowned for its challenging skiing and brings in some of the best skiers in the world. It does offer a few beginner runs but it’s mainly for intermediate and powder hound seekers! Here are our favourite ski runs in Avoriaz: Blue 5&6 – Top of Galzig lift with wide and flat blues, perfect to learn on. Blue 17– Long, wide and one heck of a run! Get on it early though as it can get a bit mougly. Red 14 – This is at the top of the Valluga lift and connects to blue 17, making it the best run in St Anton! Black 42 – Top of Kapall all the way down to black 34, watch out for those big drop-offs. 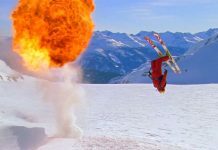 St Anton, like all other ski resorts, is mainly about skiing, but St Anton does have plenty of alternatives for those St Anton non-skiers activities. You can expect anything from Tobogganing to horse sleigh riding and paragliding to squash and tennis. Here are our guest’s favourite non-ski activities in St Anton. Looking for more accommodation in St Anton? Click here and see what we have waiting for you for this season, but be quick! Val d’Isere offers a vast ski area of 300km of pistes with neighbouring village Tignes, which was known back in 2016 as the Espace Killy ski area but now called the Val d’Isere-Tignes ski area. The high altitude resort allows for snow-sure conditions and attracts a very ‘British’ and ‘Scandinavian’ clientele. 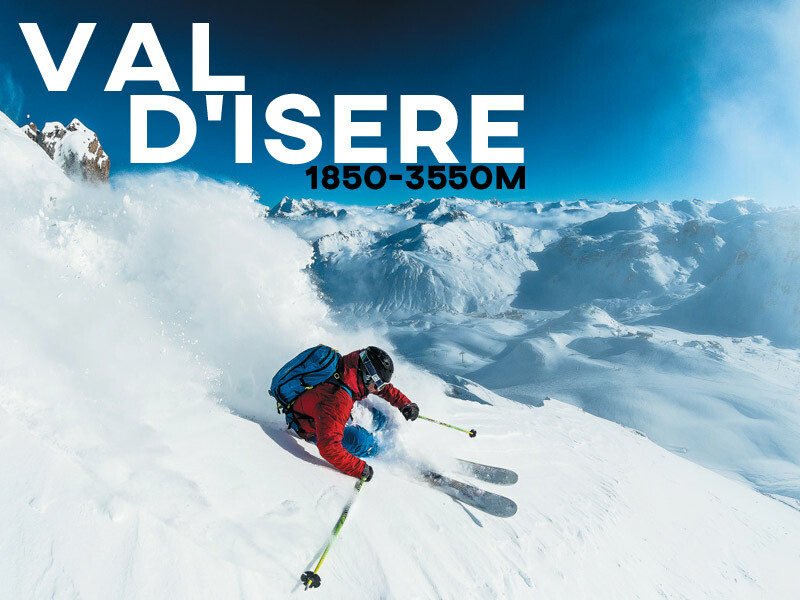 Val d’Isere is the traditional and historic half of the Espace Killy. There is a real sense of authenticity in the resort and our guests love its charm and accommodation range. There is something for skiers and boarders of all levels, from Olympic and World Cup runs to a wealth of fantastic off-piste opportunities to plenty of beginners runs high on the mountain. The resort has five beginner zones, two of which are large “ski tranquil” areas, crisscrossed with easy runs. Intermediate and advanced skiers can push their skills on the legendary slopes such as incredibly steep The Face (men’s Olympic downhill). The most challenging runs, The Face, La Forêt, 3000, Piste S, and Le Tunnel are to be conquered by high-level skiers. La Forêt is our favourite for a powder day! Here are our favourite ski runs in Val d’Isere: Rocher De Bellevarde– To access six smooth and steady green runs, perfect to warm up on. Pissaillas– Glacier side, wide cruisey blue run with big rollers, a personal favourite. Moraine– Glacier side, good snow and flexible off-piste skiing. You can easily spend a good morning lapping this run on a sunny day! The Face -Mens downhill course, many chances to test yourself. We advise to take this slope on in the morning and a few days in your holiday. It’s a leg burner. 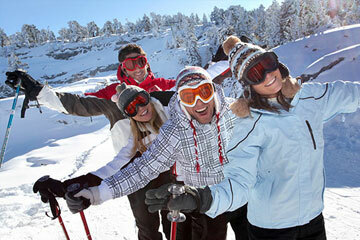 Val d’Isere non-ski activities offer you and your group more opportunities to enjoy your holiday. From ice skating to a relaxing day at the spa pool, tobogganing and ice driving to name a few. Looking for more Val d’Isere non-ski activities? In Val d’Isere, there is a great range of catered chalets, apartments and hotels to meet all budgets. Looking for more accommodation in Val d’Isere? Click here and see what we have waiting for you for this season, but be quick!